Ken is an interesting person to speak with - he has been teaching at Stonybrook University for the past 5 years. I enjoyed the conversation because it allowed me to think back on my experience in the flooring industry which I joined in 2003 and how much marketing has evolved with social media. What got me started with social media marketing? I got started because I saw traditional marketing shifting in 2005. New digital tools had the potential to better connect with customers. Traditional push marketing messages were becoming more expensive and less effective. Marketing was headed in a different direction as a result of digital marketing and social media marketing tools. I wanted to experiment so I could understand what the tools were about, how they worked and how they might help me create value for the flooring industry. They seemed ideal for educating, and I needed to prove that out. What also helped was being in a corporate environment where we were constantly in contingency. I had to be creative about how to deliver value. "The name Christine B. Whittemore can certainly be found online; a Google search of her name reveals two full pages of Whittemore-related entries — her LinkedIn account, Simple Marketing Now, Flooring the Consumer, Facebook, Coverings, Pinterest, VoiceAmerica talk radio, YouTube, Floor Covering Institute blog, and PROLibraries.com, all on the first page alone. Do flooring industry retailers truly understand the power and importance of social media? They are starting to. I've noticed a frequent misconception - not just in the flooring industry - that social media can be delegated without oversight to people with some digital experience, but little understanding of the business. As helpful as it is to be familiar with Facebook and Twitter, it's important to remember that these are legitimate customer relationship channels and need to be managed as such. What have you done to help retailers, and others, tap into this marketing message that is social media? I'm passionate about helping businesses get found online and connect with customers. Social and digital tools enable that. I like to provide a big picture perspective on how social fits into the overall business strategy and dovetails with content strategy, increating web traffic, generating leads and generally understanding customers better. I share that perspective via educational in-person sessions at trade shows, such as Surfaces - for example, read Social Media, Digital Marketing, Floor Covering Marketing: Surfaces - and Coverings - read about Selling Tile Online - Tile Industry Forum at Coverings 2013 (with Bill Buyok, Avente Tile, Tom Carr, Pan American Ceramics, Dave Milanowycz, Florida Tile, and Steve Slutzah, Westside Tile and Stone). Whittemore has been speaking about the role of social media in the flooring industry for years. During her Surfaces appearances, she has seen an “evolution” in those embracing different social media platforms." She likens the community environment of social media platforms such as Facebook to the old general store concept, where groups with similar interests and backgrounds congregate." "Whittemore explained flooring retailers should build a social media strategy into their overall business models. “It’s better to be focused online rather than being all things to all people,” she said. “Social media is like Cablevision; there are a lot of channels, or in this case niches. Know where your customers are gathering — they may be totally enamored with Facebook while another group may be congregating on LinkedIn. Today your digital presence needs to be buttoned up.”"
What has surprised you about social media since you first immersed yourself in it in June 2006 with Flooring the Consumer blog? From a personal perspective, social media has enabled me to connect with professionals who care as much as I do about the customer experience. I love how social media and digital marketing can enable you to always ready with content to educate your prospective customer -- before she is ready to buy. In so doing, you begin the relationship building and that person will be far more likely to buy from you. It means that social media integrates powerfully with a website strategy, helping increase website traffic and generate leads. Digital tools, including social media networks, offer small and medium businesses opportunities to connect with customers in ways that used to only be available to large organizations with multi-billion dollar budgets. These are exciting times! 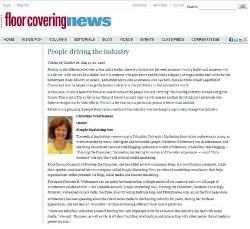 Thank you, Ken, Steve Feldman and Floor Covering News for the opportunity to discuss how social media marketing is driving the flooring industry!